Groening: We have always been working on the show. We don't take vacations, we work on the show all year round. We do 24 episodes a year about, and it takes six to eight months to do a single episode. You can add that up; it's a lot of work. Finally, finally we said we are coming up on our 20th year of existence with The Simpsons since 1987, 400th episode. We should have a movie out. How do you even begin the transition from small to big screen? Groening: We thought about what we wanted to put in the movie that we couldn't show on television, like Bart naked. And we argued over every joke. Every single scene in the movie received an incredible amount of attention, and because we didn't have a strict deadline to begin with, it took a long time to write the script. For instance, the scene with Homer on the roof with Bart, it was my contention that if you put Homer on the roof, by the end of the scene he must fall off the roof. He just had to do that. And I think everybody expected that. But the way it happened, going through the roof, was a surprise. That's the kind of stupid, slight gag that we are very proud of. Did you call everyone who had worked on the show to be part of writing the script? What about Conan O'Brien? Groening: Conan was busy, but yes, it was a Simpsons all-star team. It was some of the best writers who have ever written for the show, all together in a very small room, at a table just sitting round eating cold pizza until the wee hours and coming up with ideas. One of the writers, John Swartzwelder, has written more episodes than anyone else, he has written 49. And Al Jean, by the way, continued to be a show runner for The Simpsons the whole time. He had to run back and forth between the show and the movie while the rest of us just worked on the movie. Was there an effort to make a movie for people who may not have seen the show? Groening: For a theatre full of die hard fans, we have a lot of inside stuff. And if you don't get it, you don't know the references, it's OK, it's cute. But if you do know them, there is something extra there for you. We have found that stupidity and the love of stupidity is universal. Do people get offended by the way you joke about religion? Groening: Well, I don't know how it is over here but in America there is someone who is willing to pretend to be offended by everything. We annoy people and that's part of the appeal, it's to entertain people and to annoy a certain segment of the audience as well. You even make fun of Fox. Groening: Rupert Murdoch has played himself on the show. We wrote him a line, "I'm the evil, billionaire tyrant, Rupert Murdoch," and he performed it with relish. Have you ever tried to mirror a classic style of comedy? Groening: Well, there is definitely a tribute to the great Warner Brothers cartoons in there, and in the movie there is a part you didn't see, a good send up of Disney-style animation. One of the great bits of fun we have in the show and in the movie is that there's no style of comedy we can't tackle. We can do very sophisticated wordplay and smart dialogue and we can also do the hammer in the eye joke, that's our homage to Un Chien Andalou. That joke would not have worked in Los Angeles. Do you ever have trouble coming up with ideas? Or do you worry that you've already done that joke several years ago? Groening: After 400 episodes - as Homer would say, one for every day of the year - it is harder to come up with new ideas, but we have a staff of writers, some of whom are so young that they grew up watching the show. And then there's Al Jean, who is some kind of weird mystical genius when it comes to that. He has a really good memory, but these younger writers really have memorised every episode and will say, "We did that in season five." And if we repeat ourselves, it's a running gag, OK? You said that you would keep working on the film forever if they didn't give you a release date as a deadline. Groening: Just watching the first 10 minutes, I think, "Yeah, we could have tweaked that door slam." What I do like about the movie is that it is imperfect. It's about the art of the hand-drawn gesture. It's not a CGI movie with a thousand perfect penguins dancing in unison. We have one penguin. So what's the best part of putting the Simpsons on the big screen? Groening: In a way, the movie is obviously a thrill for us because we get to listen to an audience in a theatre laughing. That doesn't happen at home with our families. The other thing is it's also a way of honouring the people that work on the movie. The great actors Dan Castellaneta, Julie Kavner, Nancy Cartwright, Yeardley Smith, Hank Azaria, Harry Shearer, all the rest. They're all fantastic and this basically features all these characters, and in the credits you actually get to see which characters they play. The other thing is it's a way of honouring the animators. This really is a tribute to the art of hand-drawn animation, which is basically disappearing. All the animated movies these days are computer-generated and this is the old-fashioned, hand-drawn, erase it, you don't do it right? Whatever. Religion and the environment are pretty strong issues for an animated movie, yet there's a church service and Lisa's lecture about pollution, titled An Irritating Truth. Groening: The environment has been a part of the show from the beginning as well as great theological questions. Bart goes to church in one of the very early episodes and asks, "Do robots go to heaven?" And the Sunday school teacher says, "Of course not." And then Bart asks, "What about a robot with a human brain." So that's the kind of deep theological quandary that we deal with. How much hands-on work do you actually do on the series? 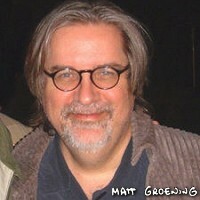 Groening: Here's the deal: I created the thing so I can do whatever I want. The truth is, and this is serious. I have actually two shows that I work on. I work on The Simpsons and I work on Futurama, my other show. What I do is this: I can tell the people at Futurama that I'm working at The Simpsons and the people at The Simpsons that I'm working on Futurama. And then I just go home.